Putting an eyeliner on eyes and giving them a perfect look is an everyday task for each and every girl. Maintaining your eyes is the basic and essential part which everyone should do. But it is the trickiest part of the make-up. One should avoid the following seven mistakes while using an eyeliner. Many of us have the habit of stretching your eyelids while applying a liner. This is the basic mistake which one commits in their daily life. This results in wrinkled skin and fine lines. Instead of this try lifting your chin up a bit and then look downwards towards them. This will help you in serving a perfect look. Giving yourself a panda-like appearance by darkening the lower lid in excess is another mistake which most of the girls do. This makes your eyes appear much smaller and narrow as compared to their natural appearance. So instead of applying a liner on both upper and lower portion of your eyes try to stick with a smudge-proof kajal on the lower lid. 3) Not aware of which liner to apply? • Pencil Liners are the simplest among them and they can be used easily while you are in a hurry. • Gel liners have a smooth texture and are waterproof so they can provide the right amount and texture on your eyes. • Liquid liners are the trickiest ones. For applying them, they need an expert. So if you’re not then you must avoid this one because you need to be extra careful while working with them. Eye-shadow is the most helpful tool which can help you in avoiding smudge. They can extend the duration of your liner and avoid smudges. 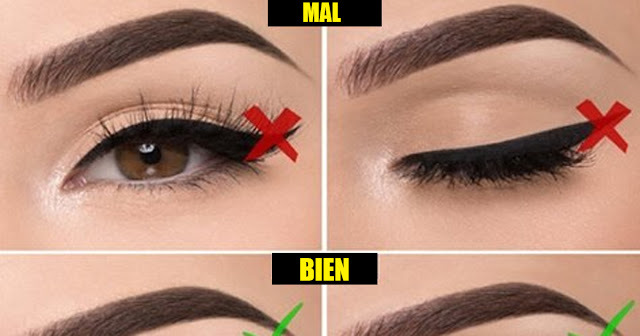 If you’re using a pencil eyeliner then you must use an eye-shadow. Avoid using an eyeliner on the inner waterline of your eyes as this can result in a terrible look. Applying in this area can make your eyes prone to bacterial infection and it also smudges easily in this area. This is another common mistake which most of us do. If you apply mascara before liner then you cannot apply a liner properly due to the less visibility because of your dense lashes. Mascara will make your lashes heavier which can result in difficulty of applying a liner. So always apply liner before mascara. Using a dry or blunt liner can damage your skin and also results in an un-perfect look. So always sharp and then use your blunt liner. It can precise your work.